Description: NS 041 FEMA Train is just south of the Wabash Hill along side of State Road 15 on the Marion Branch. Description: A pair of BNSF locos rolls at 10mph with a bad order car to be set out at Treaty 3 mile ahead on the NS 041 FEMA Train. Description: NS 041 rolls slowly into Treaty at MP 64 southbound on the Marion branch. Description: NS 041 FEMA train rolls into a curve at 10mph with a hot box to be set out here at Treaty. Description: A pair of BNSF Locos begin to cross the Mississinewa River at MP 78 on the Marion Branch. Description: NS 041 FEMA train crosses the Mississinewa River at CP-78 on the Marion Branch. Description: NS 041 FEMA Train rolls through an S curve at MP 84 on the Marion Branch. Description: Bare table heads on to the KO Sub. Description: A rare GP28P leads the H-GFDNTW south through Thompson and putting out a big plume of exhaust! Description: With RS3L horn blaring the L-CHI101 heads towards Chicago. Description: BNSF #501 And BNSF #509 Leading A Very Short Local through Centralia IL. 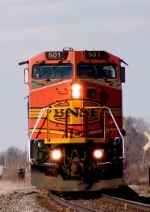 Description: BNSF #501 Leading The Local in Centralia IL. Description: The east local comes into Prairie with an extra unit in consist. Description: As night begins to take over, a BNSF mixed freight heads eastbound into Chicago with a nice lashup at the headend.